We take traditions for granted but, when you think about it, some of them are pretty odd. Amongst the more bizarre compulsory customs for a good Christmas in Britain are Christmas crackers – and I refer, not to dry biscuits eaten with cheese and pâté, but to short tubes of cardboard covered with coloured paper, twisted at both ends, each typically containing a novelty or toy, a joke and a paper hat. There is another type of Christmas cracker, though, which we’ll come on to later. Back to the coloured tubes. They will be found decorating Christmas dinner table settings throughout the United Kingdom, Ireland, some Commonwealth countries – and elsewhere, including in the Netherlands. My US sources reliably inform me that Christmas crackers are not part of America’s traditional Christmas; however, they are readily available there, ex-pats buy them and many other adventurous souls have given them a try. Still, if you’re not familiar with these peculiar objects, you may be mystified to see them in movies and so on – and any one of us might wonder where on earth they came from. So, today, all will be revealed. Firstly, what do you do with them? Well, it’s obvious isn’t it? – you grasp the ends and pull them apart; of course you do. This action should result in a sharp, satisfying, ‘Crack!’ (because each cracker contains a tiny explosive snap) – and the contents then fall out. 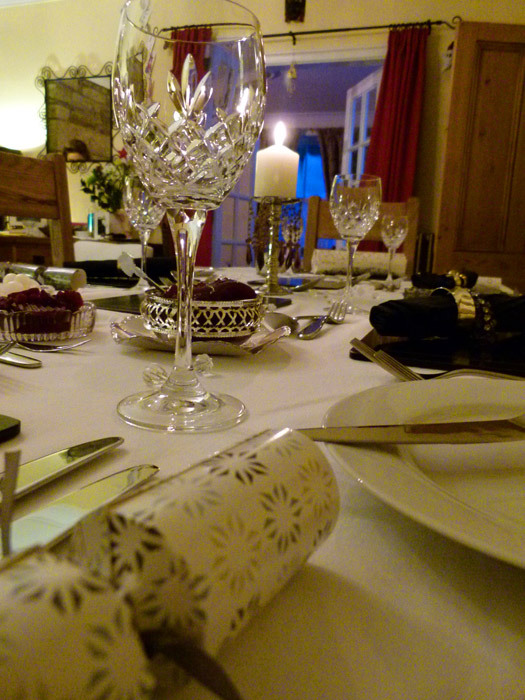 Normally, this gratifying experience is shared between at least two people, but that’s by no means de rigueur; Christmas cracker etiquette varies from household to household and I’m pretty sure I’ve pulled my very own cracker in the past, so to speak. The contents are then either taken by the person whose place setting the cracker originated from, or the person left with the larger share of tattered cracker. The paper hat – which usually has one serrated edge, like a kind of crown – has to be worn. There is no time-limit for the duration of this – I’ve witnessed paper hats still on well-fed somnolent forms well past the Queen’s speech, way into the evening and, occasionally, at breakfast the following morning; but it’s bad form to take the hat off too soon, even if it’s likely to ruin your special Christmas hair. The pointy bits on the hats tell you which way up to wear them (points up). Some people believe the hats are symbolic of crowns representing the three wise men, or something else – or it could be that they are just easy to make like that; hats are anyway part of Christmas tradition going way back. Everything has a price and, generally speaking, the quality of cracker largely depends on how much you are prepared to pay. I see from the ridiculously cheap box of family crackers I purchased the other day that we can look forward to a range of exciting and nifty novelties which include a paper-clip, tape-measure, toy duck and an imitation moustache (this looks like an instrument for nasal torture). The slightly more luxurious set, which I bought just in case we have visitors, will yield a shoe-horn, pack of playing cards, bottle opener (possibly a bit late for that) and – something I really have my eye on – a set of kitchen measuring spoons. More upmarket crackers contain correspondingly more expensive novelties – fireworks, cuff-links, silver-plated dog whistles, diamond rings, gold-plated tooth-picks…I’ve known people make their own crackers and insert miniature bottles of spirits or costume jewellery. It doesn’t neccesarily have to be tacky, or ostentatious; but it should be FUN. As a teenager, I once got a plastic water pistol, which I carefully filled with borrowed alcohol and took to a party the following evening, sharing the contents with a good friend. (Why? – because I was a teenager.) Most cracker novelties are pretty useless, though, and usually left forlornly abandoned at the table. However, my mother used to keep them for at least the next 12 months – actually, I’m pretty sure she had some left over from the Blitz. What do you call a bunch of chess players bragging about their games in a hotel lobby? Chess nuts boasting in an open foyer. How does good King Wenceslas like his pizzas? Deep pan, crisp and even. How did Scrooge win the football game? The ghost of Christmas passed. What did Adam say to his wife the day before Christmas? Why did Santa’s helper see the doctor? Because he had a low “elf” esteem. I know, I know; if you’ve never pulled a cracker, you’re now getting excited and want to know when you can get to them. When I was a boy, crackers were pulled when the meal was over; other families pull them before they start eating. It’s your choice. Research suggests that crackers are meant to be all pulled at once, by people crossing arms around the table: but I have never seen it done that way and think cracker pulling should be a fairly random affair; just pick someone next to you or across the table – but do make sure no one is left out. 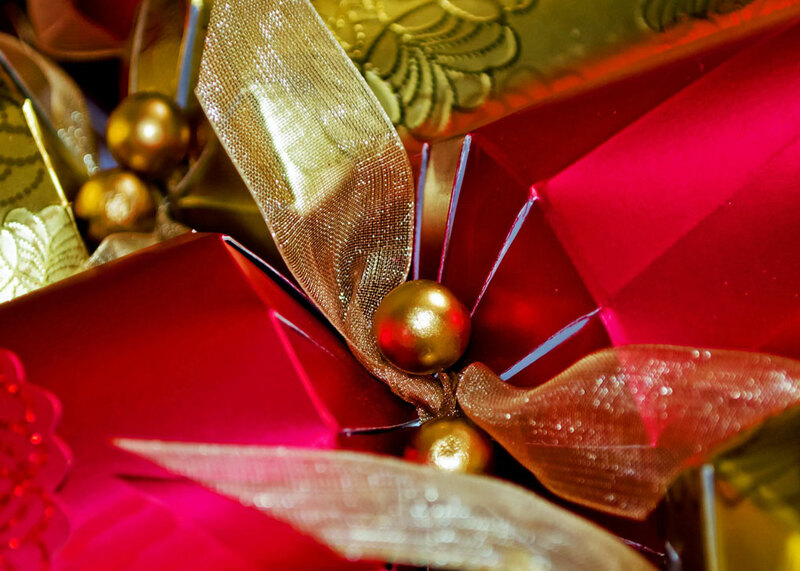 Where did Christmas crackers come from, anyway? 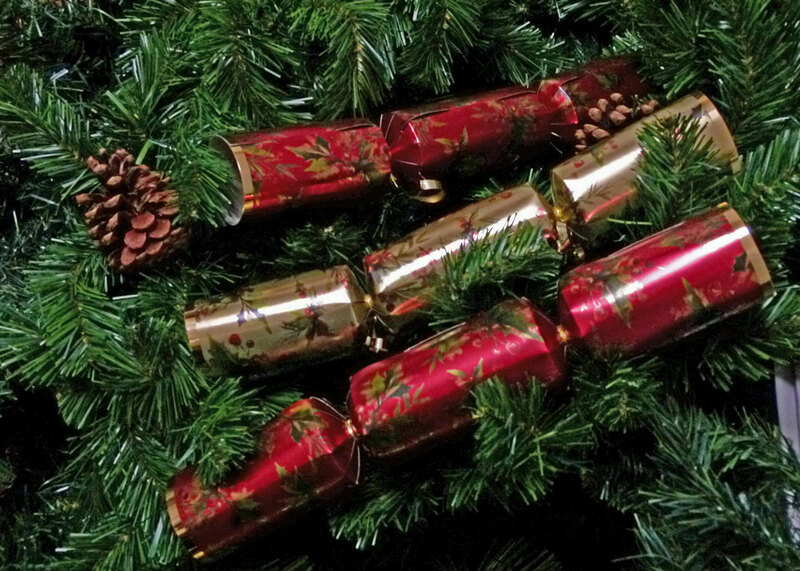 The story goes that Christmas crackers were invented by an innovative London confectioner called Tom Smith in 1846. Allegedly, on a business trip to Paris he found a French confectioner who wrapped his sweets – bonbons (small pieces of candy) – in tissue paper. Tom thought that was a grand idea so, when he returned to England, he bought a stock of sugared almonds and sold them wrapped in tissue paper just in time for Christmas. Next, he added a little love motto. Gradually, the wrappers became more extravagant. At some point, the sweet was replaced with a novelty. Tom then thought it would be fun if the crackers could be pulled apart so that the contents would fall out. The story goes that he was inspired to add a small ‘bang’ to this process by watching a shower of sparks in a log fire and then spent two years developing the ‘snap’ inside the cracker, which emits the ‘crack’ when pulled. 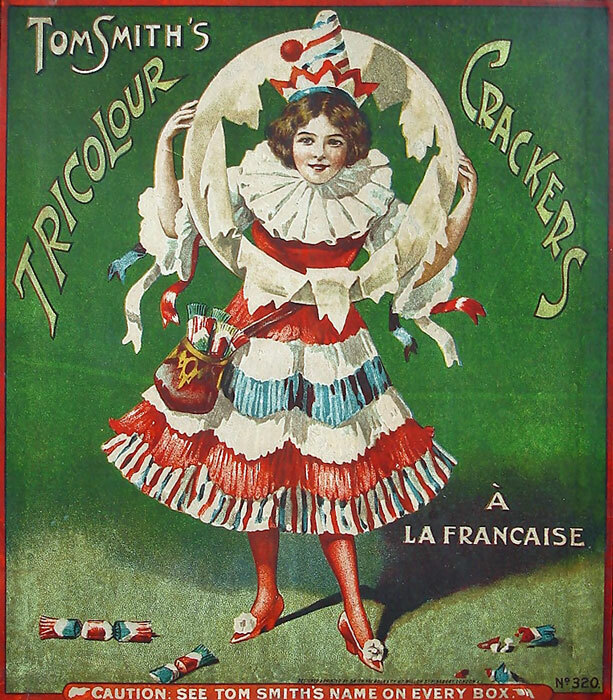 The first crackers were called ‘cosaques’ – French for ‘Cossack’ – some think because the sound of the cracker ‘snap’ sounded like the whips of Cossacks, though how they come into the story, I just don’t know. However, the ‘snap’ was not invented by Tom Smith – it was in use as a type of firework fifty years or so before becoming an essential component of the Christmas cracker. I wonder if it’s possible that the cracker got its name from the snap – as in the ‘cracking’ sound. If you want to know the true story, you need to read Tom Smith’s Christmas Crackers – an illustrated history – by the world’s only cracker historian, Peter Kimpton. Peter’s revised second edition – Christmas Crackers – Tom Smith’s magical invention – is available from his website, the King of Crackers. Sadly, Tom Smith died in 1869 aged just 46. But the business was taken over by his three sons, and thrived. Walter Smith introduced the idea of paper hats and, gradually, the love mottoes were replaced with jokes. In London’s Finsbury Square, where the company moved having outgrown Tom’s original premises in Goswell Road, his sons Thomas and Walter erected a drinking fountain in memory of their mother. Tom Smith & Co produced exotic and exclusive crackers with luxury gifts inside for the high-end market, as well as making crackers based on themes (for example, spinsters and bachelors!) and for special events. The company was granted its first Royal Warrant in 1906. 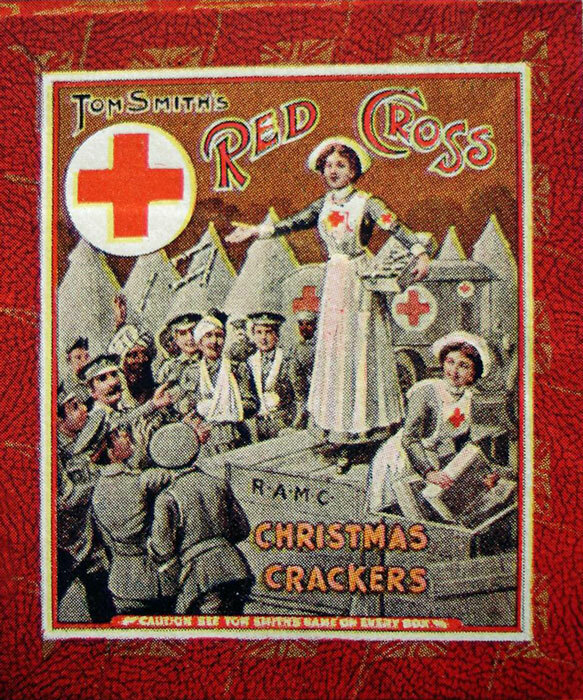 I like the story Peter Kimpton tells on his website, of a British Tommy writing home from the Western Front and saying that one of his pals had received a box of Tom Smith’s Crackers which he shared with his chums during the unofficial Christmas Truce of 1914. In the 1920s, the company even produced a cracker – 18 feet long – for a London banquet, from which waitresses emerged, distributing gifts. Sounds like my kind of lunch. In 1953, Tom Smith & Co merged with Caley’s Crackers and everything moved to Norwich. Today, the Tom Smith brand is owned by International Greetings based in South Wales. Most crackers are now made in China. I am trying to find out how many are pulled in Britain each year – one estimate I saw was 300 million; when I find out, I’ll update this piece. I’m grateful to Peter Kimpton for his help – if you want to know more about crackers, visit his website at the King of Crackers. He also supplied the two older looking images. Earlier, we mentioned another type of Christmas cracker. Students of native English will know that ‘cracker’ is a slang term for ‘a good-looking female’. In 1984, DJ Mike Read was pushing a single I’m a Little Christmas Cracker by an obscure British group (possibly from Bristol) called the Bouncing Czechs. The flip side to the single contains the outrageously funny Ballad of Mary Lou, who has the misfortune to blow up whilst using the hair-dryer. But the ‘A’ side, delivered with just the right amount of spritely and mildly salacious innuendo by the singer, Charlene Ducall, is a corker. At one point, the question is posed: “Which one of you big strong boys wants to pull this little Christmas cracker?” Unfortunately, it disappeared without trace – along with the Bouncing Czechs. Crackers at Christmas are not a tradition on this side of the pond, but they are not unheard of, either. There are enough British and other Commonwealth Expats in the U.S. that the two major kitchenwares chains, Williams-Sonoma and Sur-la-Table, both stock Crackers amongst their Christmas offerings each year. Crackers aren’t that difficult to find in the U.S. if one knows where to look. Thanks, Mike! I love crackers! I just pulled out the Christmas crackers I bought last year on sale and now when we pop them I’ll have some intelligent conversation to bring to the table! Well, if anyone listens. We always do wear the hat (some, somewhat reluctantly!) I love the history and learned a lot — not the east of which is that two people pull on it! Who knew? Not us! This year we’ll have to be careful of choking objects! Thanks for sharing all the history with us! Hope you and Mrs. Britain have a fabulous holiday! Well, three cheers and thanks much for this one! I just pulled out our crackers today to take for holly jollying. Now I can actually offer some borderline intelligent conversation about them as we pull them apart. Like, I didn’t know that two people do it — I thought we all did our own. That would make it more fun! Love reading the history too — you tell it well! Merriest to you and Mrs. B! There are loads of them on shelves here in Canada at the moment, but as far as I know, it’s not a tradition so much as a random impulse to do something a little different now and again. 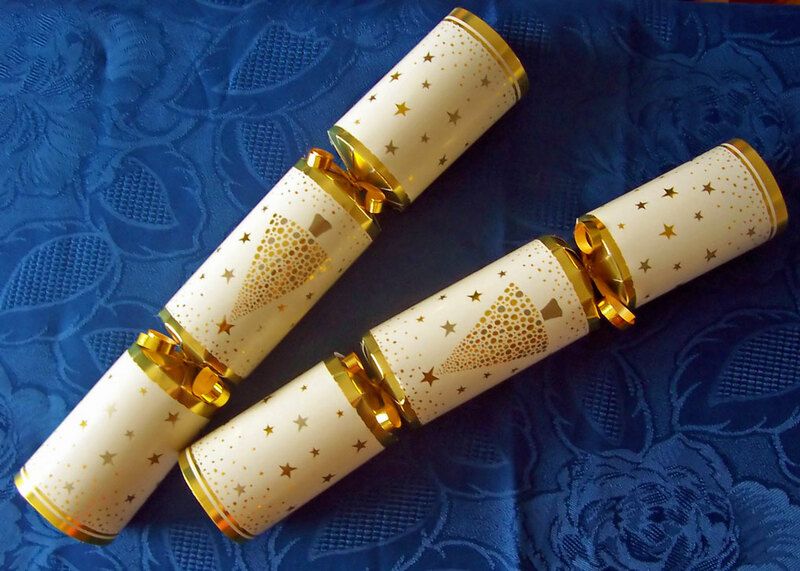 I never heard of Christmas crackers until I was an adult, but when I was a child in Los Angeles, California, about 65 years ago I remember having them occasionally at birthday parties. All the mothers bought matching plates, cups, napkins, nut cups, and other things to decorate the table (pink for the girls, blue for the boys) at the local dime store — Woolworth’s or Kress’s. Among the things to be bought were crackers, although I never heard them called that. There was no joke or toy, just the noise and a hat. I had not thought of them for years! Thank you for the interesting article! Thanks, Dorothy! Pop in again! In fact I shared a box of crackers with my Scrabble group yesterday and it was real fun! Thank you – and thank you for dropping in! Thanks for the Cracker History…Here in the US many people have no idea what they are…I love all things British and jumped at the chance to set a table with crackers…but I can never wait till Christmas and set our Thanksgiving table with the Crackers…very fun! Thank you very much! When I first wrote the post, the only Bouncing Czech version I could find wasn’t very good sound quality – this one is much better; perhaps I should update the article! My pleasure. It looks like your post and the song were uploaded within days of each other. You must have just missed it. You might do an addendum to the post, but I wouldn’t get rid of the original version of the song. I still have a bunch of wind-up santas from the crackers we bought a couple of years ago. They live in the toy drawer and, um, I don’t think they get played with but you never know. A friend of mine had some clockwork nuns. Now I need to spend a Christmas in England and enjoy the experience of crackers. Very interesting Mike. Many years ago when I was the editor of a drama group newsletter I did a similar article. I love crackers, they sit tucked into the Christmas tree until Christmas day and then Boxing day. Merry Christmas. 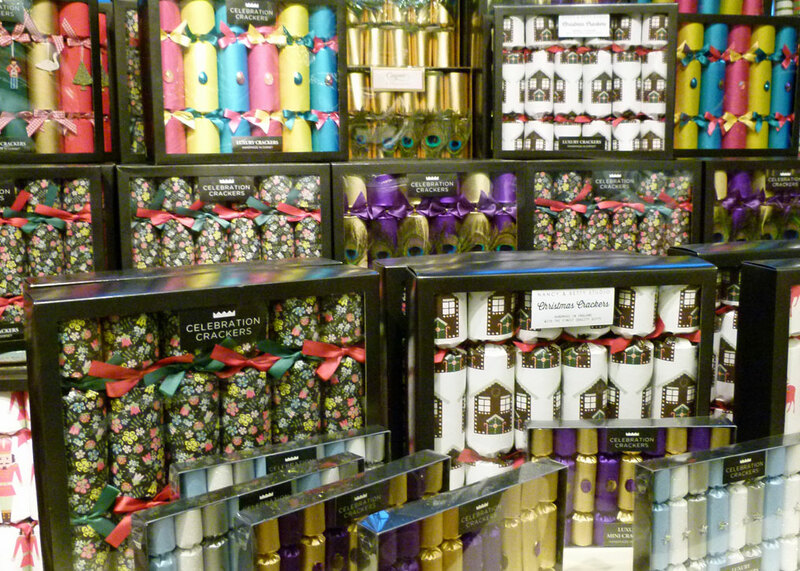 As there are many British expats in Brittany, it’s fairly easy to find Christmas crackers here. I was wondering if I should buy some this year as the only year I did, it helped everybody relax once we had stupid hats on… which is great as Christmas lunches in my family can be very tensed… Now that I read the post, I know what I need to buy tomorrow! Just don’t play Monopoly – it invariably ends in tears! Yes yes me too, I love Christmas crackers. They are a tradition from my childhood. I used to gather up all the little plastic gifts and hoard them. I think I’ll have to go out and get some before they are all gone. We could use them at our family Christmas Eve Breakfast! Another interesting post. We always cross arms around the table to pull the crackers before we eat. We like a cracker in our house. My grandmother always called them bon-bons which we thought quaint when we were young but of course that’s how they started out. My mother tells me that the hats in crackers when she was young were works of art not just tissue circlets. When they were unfolded there were hussar hats, lady’s bonnets etc. You can get indoor fireworks, Bob. Not very spectacular, of course, but safer than nailing a Catherine wheel to the kitchen door. Although I have yet to spend Christmas in Yorkshire, through my family there I have introduced Christmas Crackers to my German family. Now they all know and love them – yes, even the bad jokes – and don’t want to have Christmas without them anymore. Of course, they are not easy to come by in German shops, but that’s what the internet is for. Hi Mike – great fully detailed summary .. we had 80 Christmas Crackers last night – quite good ones … the front of our hats had gold, the back – green tissue! They are all beguiling in their Christmas wrappers – so colourful … love the jokes – I may pinch the Good King Wenceslas one for my GKW post … acknowledgements forthcoming! I love Christmas crackers! It tickles me how EVERYONE wears the paper crowns, even the men! This is one of my favorite jokes…Where does Queen Victoria keep her armies? Well, I remember pulling crackers in my childhood, about 5 decades ago. We also listened to the Queen’s Speech, or at least had to be quiet while my mother listened! A very interesting post Mike, thanks. You can never have too many crackers in the house at Christmas … we always make sure there are plenty for the New Year period too! The cornier the jokes the better!!! Hope your Christmas preparations are going well. We’ve had Christmas crackers a time or too and always enjoyed them, though the jokes weren’t very good/bad. They don’t seem to have ended up making the crossing over the ocean as a tradition.